What is Arrow-Dortim (Dorzolamide Hydrochloride/Timolol Maleate) used for? Arrow-Dortim Opthalmic Drops are a treatment for glaucoma or any other eye condition that can cause increased ocular pressure (IOP) in the eyes. Arrow-Dortim contains Dorzolamide Hydrochloride and Timolo Maleate, both of which inhibit fluid production in the eye. Each active ingredient has a different mechanism of action, so it works more effeciently than Dorzolamide Hydrochloride or Timolo Maleate alone. How should I use Arrow-Dortim (Dorzolamide Hydrochloride/Timolol Maleate)? 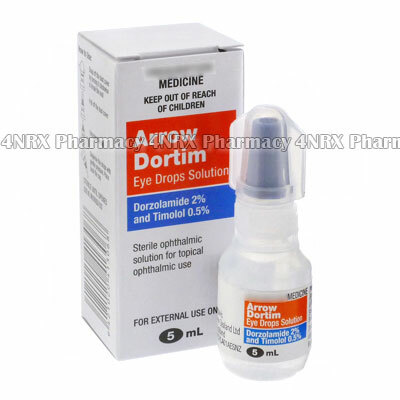 Arrow-Dortim comes in a 5mL bottle of Opthalmic Drops, complete with a dropper for application. The concentration of active ingedients are 20mg/mL of Dorzolamide Hydrochloride and 5mg/mL of Timolo Maleate. Most people obtain siginificant results by applying one drop to each affected eye twice daily. If you are taking any other opthalmic treatments along with Arrow-Dortim, wait at least ten minutes between applications. What are the side effects of Arrow-Dortim (Dorzolamide Hydrochloride/Timolol Maleate)? Many people taking Arrow-Dortim feel a burning or stinging senstaion in the eye. This usually occurs right after application and disappears soon after. You may also notice taste abnormalities for a short time after taking Arrow-Dortim. Dorzolamide Hydrochloride and Timolo Maleate have also been known in rare cases to result in cardiovascular abnormalities, nausea, diarrhea, vomiting, abdominal pain, urinary tract infection, upper respiratory tract infection, and flu-like symptoms. If you show any signs of an allergy to Arrow-Dortim, you may need to stop taking it immediately. Contact your doctor for advice. If you belong to any of the above categories, contact your doctor for advice.